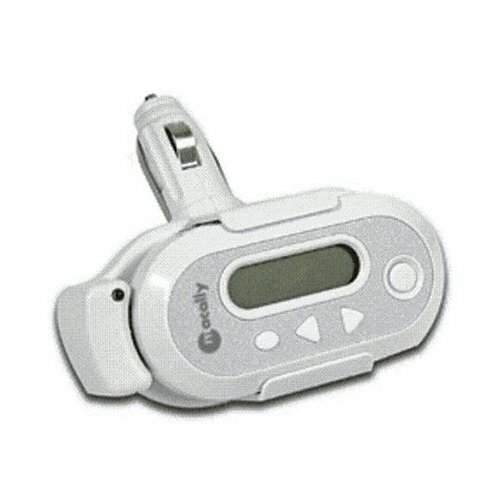 This iTrip FM transmitter for third-generation iPods can play your music through any FM radio: in your car, at work, at a party, wherever the mood strikes you--so long as there's a radio handy. The iTrip gives you the cleanest possible signal, too, since you can tune for the best performance by choosing any radio station on the dial. What's more, the iTrip needs no batteries--it draws its tiny (nearly unmeasurable) current directly from the iPod, and it can rotate out of the way so you can charge the iPod while the iTrip is still in use. Choose the best frequency for broadcast. The iTrip can transmit wirelessly to any radio. There's not even a power switch--you just plug it in and go. It shuts off automatically after 60 seconds of silence, just like the iPod. If the iTrip is already connected to the iPod, it will turn itself on after it detects a few seconds of audio. 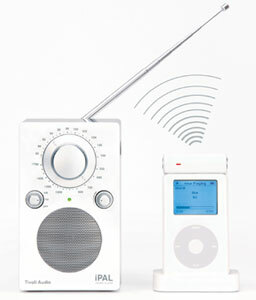 With iTrip, you have over 100 stations to choose from, which you select directly from the iPod. An installed playlist from the supplied CD-ROM called "iTrip Stations" contains every available station. You can keep them all in your iPod or just keep the ones used regularly--you manage them just like songs. How does it sound? All the iTrip does is create a miniature FM radio station on top of your iPod, so it has the potential to sound as good as the best FM radio stations. The iTrip does not have the physical space to accommodate the iPod remote control (it lacks the required female iPod headphone connector to provide a signal pass-through), and the iTrip occupies the iPod's headphone jack, so it's one or the other at any given time. Be advised that some car windshields impair FM radio transmission, which could prevent you from using the iTrip with your car's radio. Some windows have a metallic film that substantially blocks the FM signal traveling from within your car to your external antenna. You can usually tell which windshields have the film by looking carefully--if you see an unusual bronze or reddish tint, you may have the metal film, or if your see a very fine grid pattern you may have woven metal wires, but check with your dealer to be sure. Great compliment to your ipod! I bought this product in June 2004. I have a second generation ipod and was looking for a way to connect it to my car stereo. My brother had suggested sending RCA cables up behind the dash into the auxiliary input of the stereo. This sounded like it would be a pain, though, so I thought I'd give Griffin Technologies' ITrip a chance. When I received the item, I was delighted to find that the sound quality was actually quite good. I had read some people giving it poor ratings due to sound quality. Maybe it's because the city I live in (St. Louis) isn't packed from one end of the dial to the other with FM stations. Maybe it's because of the radio I was transmitting the signal to. Whatever the case, I found the item to be very nice. It comes with some software which is easily installed. You just put the cd in and it automatically adds an FM "playlist" for each frequency on the dial (every other .1 KHz, i.e. 89.7, 89.9, 90.1, etc.) to your music program (for me it was MusicMatch Jukebox, I'm sure it does the same for ITunes or WinAmp). As soon all the station playlists have been added to the program, one simply needs to connect the Ipod to the computer to synchronize it with the computer, and then you're ready to go! It took me a matter of minutes to figure out how to use it. All you do is connect it to the top of the Ipod unit via the headphone jack, a little blue light comes on, and then you go into "playlists," choose a frequency, then press pause. This sets the ITrip to transmit to that particular frequency. If you want to try a different one, you simply go back to your ITrip playlist, choose another, and press pause. The blue light flashes several times once the chosen frequency has been locked. I chose 101.7, which is in between two large stations in St. Louis...101.1 and 102.5. I figured that frequency would have a fairly large buffer between it and either one of the high strength stations adjacent to it and thus a clear signal. I was right, and the sound quality was really good! The most important thing I found was positioning of the unit. I think it has to be positioned a certain way for best sound quality. The Ipod volume also has to be at an optimum setting for the best sound quality. Most of the volume control is done through the radio volume control anyways, not through the Ipod. Also nice is the fact that the unit does not require batteries! All in all, this is a great little item if you plan on taking your Ipod with you on the go. The only thing I'm not sure of is taking it on long roadtrips. It might require changing the ITrip's frequency many times because while a particular frequency may be unoccupied in one part of the country, it may house a very strong signal conglomerate radio station in another part. Regardless, I'd strongly recommend the item to anyone interested. It's affordable and it does its job as advertised. I have to say, I don't understand what all the complaints are about. I live in Los Angeles, and rarely have any problems on all types of radios. If it starts to get staticy - usually close by a major radio station in town - I change frequencies and am good to go. People complaining about audio quality should adjust the volume on the Ipod, as if it's set too high, the sound distorts. You should keep ipod volume levels in mid range and use the volume on your stereo. Also - they might not be setting the stations correctly. Also - installation is NOT COMPLICATED. All it is is Mp3s of all the radio frequencies and a Playlist to put them all in for easy access. The itrip responds to these short mp3s and if you hit the pause button while they play you reset it to a different station. Easy as that. In fact, the quality is so good that anyone with a radio in my office can set theirs to the frequency and listen to what I'm listening to. Only on soft songs do I detect some static, sometimes. I give it four stars only because I think ipod should just come with this feature installed inside. Don't listen to the bad reviews - this is essential for ipod owners. Well I had a Bad iTrip. The thing was a knobathon to get going in the car while driving (and that was with my CoPilot) and when i 'luckily' found a station almost by accident, it sounded terrible. Like an MP3 thru an FM channel or an FM station thru a tin can. it has been returned - up for auction it goes. I will first say that the ability to choose which station you want to us brilliantly better than the numerous iPod transmitters that only let you choose between 4 pre-set frequencies. I will also add that the iTrip is powered through its connection to the iPod iteself and consumes very little of your iPod's power supply, which is also an excellent feature. The only problem is that the stations on which you can broadcast are stored ON your iPod as mp3 files. That means that they appear in your library, and worse, if you are like me and usually like to just listen to your entire library on "shuffle", what happens is that you will "shuffle" to one of the stations, effectively *changing* the station on which you are broadcasting. This is a supreme pain in the buttocks, because invariably you will find yourself broadcasting on a frequency that is competing with a high-powered radio station in your area, and, worse, you have to suddenly change your car stereo's receiver to match it. You will never realize this is happening until after you are blasting static, though. In the end this fatal flaw makes this device worthless if you like to shuffle. You already love your iPod. But think how much better it would be if you had the ability to use it in the car. Monster Cable's iCarPlay wireless FM transmitter gives you just that: great sounding, wireless access to your entire multi-gigabyte collection of tunes, right through your car stere's FM radio. At the same time, the iCarPlay charges your iPod to keep the music playing. 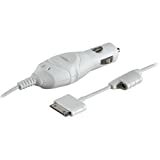 Plug the iCarPlay's charger end into the 12-volt DC outlet (cigarette lighter) in your car and plug the other end into the dock connector on the bottom of your iPod. Select an FM station on the iCarPlay (choose from 88.1, 88.3, 88.5, 88.7, 88.9, 89.1, 89.3, or 89.5), and find the same station on your car stereo. Then pick your favorite song on your iPod and you're ready to roll. Your music transmits wirelessly to your car stereo using FM radio frequencies. i'll try keep it short here... this thing works great. some knucklehead kid at the Mac store tried to tell me it was no good and to get the iTrip, so i got that and started walking to the parking lot. got to my car and was about ready to rip the iTrip box open when i see that there's a CD inside. the iTrip needs to be set up with software! that's weak! i want plug and play. so i rolled back to the Mac store, exchanged the iTrip for my original choice... the Monster iCarPlay. plugged it into my cigarette lighter, set it to 89.1 (empty frequency for L.A. people!) and bad-bing! it was on. it has eight manually switchable frequency choices. the thing charges my iPod while i've got it on, too! the iTrip DRAINS your iPod... which we all know is a bad thing by now. keeping the pod charged is a constant challenge, eh? many other similar devices require their own batteries. this is an all in one solution. had it six months now. remember... it'll never sound better than the best FM station you've ever heard. once in a while you'll hear a little static for a few seconds. a straight "line in" would obviously produce better sound. but for those of us who don't want to or can't deal with a line in wiring job... this is your answer. i'm a former record producer and the FM quality sound is just great to my ears. the bad... well if you are driving long distance you will eventually run into a radio station that occupies the band to which you have it tuned. so you've got to switch channels... which is EASY on the Monster... if you are not driving the car. i believe on the iTrip you've gotta reprogram the darn thing on your computer to get to another frequency (not sure about that though). anyway, this works great for me especially since my GM car has a stock Delco stereo system that has no standard line in plugs. Open the box, plug it in, set your station with the easy interface, and you are rollin' with tunes in less that a minute! Plus, if you have another car, or are riding in a friends car, you can just take your Monster iCarPlay and your pod with you and subject whomever to your fabulous taste in music! - You have it plugged into your car to power the transmitter (Doesn't use iPod battery power for transmission). - I use this on my commute in a major metro area and find that I have to change the channel while driving often. Yes, there are stations 88.1, 88.3, 88.5, 88.7, 88.9, 89.1, 89.3, and 89.5 (or stations are bleeding through 2 or 3 point channels). No need to be skeptical of this product. This product works great. I have had it for about a week now and have no prblems with it at all. The only thing you may want to do is play around with the settings on your car radio as well as your Ipod for maximum sound quality. I live in Dowtown LA, and commute a lot around the city due to my work. This product is wonderful on what it's supposed to do. This product is not a disappointment. If you want a great transmitter and a charger, purchase this. Great sound from my IPOD in a Metro area! One of the biggest disappointments with my new car was the lack of an input jack on the stereo. I had looked into buying a new head for my stereo, but soon realized this was out of my price range and didn't make sense w/ my stock speakers. I began looking at FM modulators/transmitters because I wanted to listen to my IPOD in my car and I do not have a tape player. I just purchased the TuneCast II and began using it. It works wonderfully! I haven't heard any static...or any of the problems normally associated with a FM modulator. I don't live in the middle of no-where either. I live in the large metropolitan area of Kansas City, MO (over 1 million people). I don't know how well this would work on the East or West Coasts...but out here in the Midwest, it worked excellently! Excellent sound quality, little to no interference. Like some other reviewers, I too was skeptical before buying this, due to the scarcity of reviews for this new model and the poor reviews of the older model. I took a chance and couldn't be happier with how this sucker performs. This device works by transmitting a signal from your MP3 player (or other music device) to an FM radio frequency that is not being used by a broadcast radio station. One major drawback of most cheaper transmitters is that they only allow you four pre-chosen frequencies on which to transmit your signal. I live in Chicago, where most of the FM dial is occupied by one radio station or another. With just four pre-determined frequencies, chances are good that they're all already occupied by a radio station. This is not an issue with the Tunecast II, as it allows you access to the full range of FM frequencies. There's also a four station memory function which allows you to find and store the four frequencies on your dial that work best for you. Very nice touch. One trick I've found that helps in finding a good frequency in the car is to retract the antenna. This helps a lot to filter out any stations with a weaker signal, particularly those at the lower end of the dial. Sound quality is very good, but obviously it's going to be limited by the quality of your radio and speakers. For me, the primary advantage is that I can listen to my MP3 player in the car. For all the radio stations we have in Chicago, I've always had a heck of a time finding anything I want to listen to. Not anymore. In short, the Tunecast II is one of the costlier FM transmitters, but you get what you pay for and this is money well spent. I can't believe I forgot to mention this, but the Tunecast II goes further in justifying its higher price by including a power adapter that plugs into your car's cigarette lighter. This is a huge plus because these things go through batteries like a monkey goes through bananas. i've never written a review of any of the products i've bought from amazon before, but i felt pretty compelled to write one about this. if you consider the price and utility tradeoffs for this transmitter, its of good value. of course you can't expect to get cd quality transmission from this, but it works pretty well for the most part. the only bad thing i've found so far is that even on stations where i get the clearest signals, there is some static in the background. this static is only audible when a song is at a quiet part or when there is no song playing so it isn't as bad as you may think. other than that, the sound quality actually kind of surprised me. btw, i live in los angeles where almost every station has some sort of signal, which is also why i am surprised that the product works as well as it does. overall, i am pleased with my purchase and although i haven't tried any other fm transmitters out there, i would recommend others to buy this if you can't use a cassette adapter. Based on other consumer reviews, I thought this upgraded version of TuneCast would perform well -- but not perfectly -- in my car. It didn't. The device couldn't broadcast my Ipod clearly on any station. The static-filled music came through very weak no matter what I tried. The problem may be that the car antenna is located in the back of my Audi A4. Looks like I'll have to plug my Ipod casette adapter back in when I drive this turkey back to the store. Absolutely in love with the Shuffle armband. Looks great, works even better. Typical Apple (ie. very high-quality, and not fugly). The armband is real snug if you have fat arms like me.The petite types should have no problem.Just be aware that it barely fits if you are 6 foot and weigh 220lbs. This armband is awesome. I bought it to use with my shuffle at the gym, and although I was skeptical at first, I'm so glad that I made the investment. It's lightweight, doesn't slip around no matter how sweaty I get, and best of all: it fits my arm. Like many other women, the iPod armband was too big (and bulky) to comfortably fit my arm. The shuffle band gets small enough to fit a kid, but I've also seen big guys at my gym wearing it, too. It also leaves the shuffle controls conveniently available and close at hand during a workout. There's no more tricky scrolling through music on my iPod or fiddling with the shuffle while it bounces around my neck while hoofing it on the treadmill. I can even wear the armband while I strength train with weights. It's flexible and doesn't constrict my bloodflow. The shuffle band rocks and is totally worth the $$. I initiallyhesitated to buy this armband since it was a third of the purchase price of the shuffle itself. But I decided to go ahead and splurge and just consider it a part of the package price of the shuffle. I bought the shuffle specifically to use at the gym and thought of it this way: a good pair of sports headphones is going to cost about $30, a good jog bra costs about $30,a good pair of gym shoes costs a heck of a lot more than that, etc. If you're serious about getting or staying fit, and you bought the shuffle to help make time at the gym or on the pavement a little less heinous, then this armband is another accessory that's worth the price. I don't see a lot of people whining about the cost of the other accessories that they buy for the same reasons. Great for workouts, jogging etc. with iPod Shuffle! This is a must have accessory for anybody who works out with an iPod Shuffle. It fits the Shuffle perfectly and is a perfect solutionto clip secure it. Ofcourse it looks cool too with Shuffle clipped on. It may look like its overpriced but sometimes you gotta pay for the cool looks and ease of use. Don't we all like and overpay for designer items or fancy cars? Very good gift item for someone who already own an iPod Shuffle! 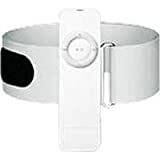 Just when I thought that I will learn to forego the screen and use the screenless iPOD shuffle, I learn that I have to pay 30% of the price for an armband - otherwise the unit will keep on bouncing on my chest as I tire out on the treadmill. Listeners love the iPod for a variety of reasons, including its high-quality sound, clever design, and user-friendly functions. Harman Multimedia pays tribute to this efficiency with its JBL On Stage docking speaker system, which broadcasts your favorite iPod music while offering many of the same creative benefits as the iPod itself. The device employs four Odyssey Neodymium drivers to deliver a full spectrum of audio--from profound bass notes to crisp high frequencies--along with computer-optimized equalization that seamlessly blends the tones for clarity. The device makes a natural companion to all versions of the iPod, with a sleek, inventive housing that cradles the iPod body while adding a modern touch to your décor. The device is also compact--measuring 7 inches in diameter and 2 inches tall--meaning you can take it virtually anywhere. 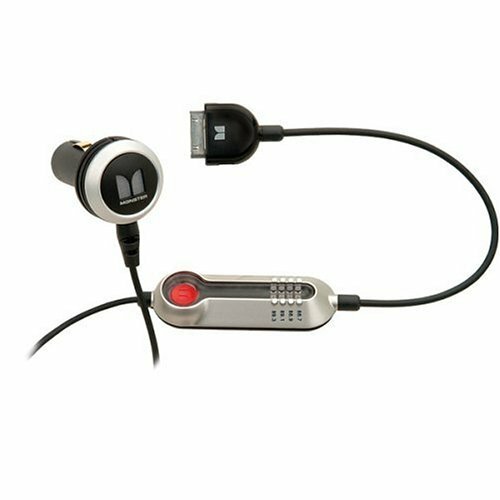 Merely stuff it in a backpack, suitcase, or car compartment and enjoy its full-bodied audio while on the road. The JBL On Stage come with adapters for all versions of the iPod, including the iPod mini. As with any device that accompanies an Apple product, the On Stage is also remarkably easy to use, with a touch volume control and a full iPod charger. A simple touch of either pad increases or decreases the volume, while touching both pads simultaneously mutes or unmutes the speakers. The On Stage also remembers your last volume setting even after the system shuts down. Charging your iPod is effortless as well--merely plug the iPod wall charger into the On Stage and rest the iPod in the dock. The On Stage takes care of the rest. Listeners can also charge their iPods by plugging the On Stage directly to a computer with the OnePoint connectors. The system charges the iPod whether it's powered up or not. 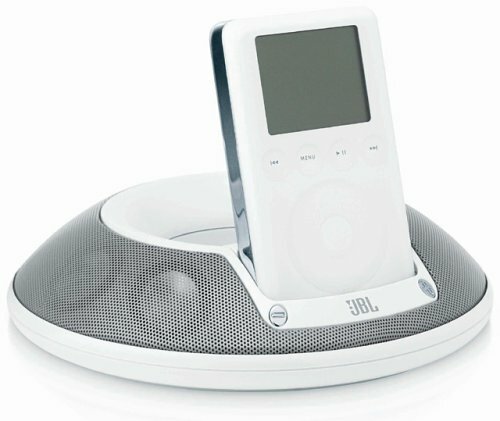 The JBL On Stage is compatible with all versions of the iPod, including the iPod Mini. It also connects to other portable audio devices, such as MP3 players, CD players, and laptops, via its stereo mini jack connection. I confess it took me a while to get the hang of these little guys, that's why I'm giving them 4 stars only. Having tried my friends original headphones and realizing they were very unconfortable and actually hurt my ears after wearing them for a while, I decided to buy the in-ear Apple headphones when I first got my ipod. At first I tried the medium and the small ear caps since I don't have particularly big ears, but as it has been mentioned before I only managed to get them stay into place when I wasn't moving, excercising or chewing! To my surprise when I tried the large size caps they stayed in my ears even when jogging! What a delight! I'm no sound electronics expert or anything, just a regular music lover, and I must say that with these headphones I have discovered sounds in my favourite songs that I didn't even know were there! A little tricky at first but in the end, a satisfying purchase. Baloney, these earphones are terrific! I've got 15 sets of headphones and earphones surrounding me as I write this, and the iPod in-ear phones blow away all of the ear buds and most of the headphones. They're probably only 4 or 4.5 stars, but I gave 'em 5 to offset the 1-star reviews. Maybe these guys got pre-production phones or had problems with them; mine are excellent. The only complaint I agree with is that cord sounds are transmitted to your ears, so you have to take extra care positioning the cord. But I'd rather have that than having ear buds jiggle when I run or even walk down stairs. Regarding the tone, they're much flatter in frequency response than ear buds. The lows are not exaggerated, and the highs are very articulate--the ear bud fans probably never heard the highs from their iPods before. They sound very much like my Sennheiser HD 280 Pro phones. This are the only earphones that fit in my ears. I love the sound of them and I would highly recommend them. Everyone loves Apple's portable iPod digital music player, and taking music with you on the road can be a life saver. But you probably don't always feel like putting your headphones on, especially once your back at your hotel room--or if you're organizing the garage or simply making dinner. 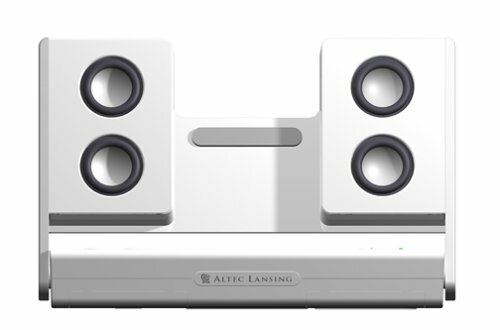 Altec Lansing has created a headphones-free portable listening alternative: the inMotion powered speaker system, the first portable audio system designed expressly for use with iPods. With its compact design, ultra-low battery power consumption, powerful class-D amplifier, patented MaxxBass technology, and even a built-in iPod dock, inMotion gives you performance you'd never have thought possible from a portable audio system. inMotion features four full-range, custom-designed neodymium micro drivers (two per speaker) for clear audio output. Using principles borrowed from the professional audio world, inMotion also delivers incredible, natural-sounding bass at frequencies far below those normally possible from small speakers. No bigger than a trade paperback book, inMotion turns your iPod into a platform for convenient, headphone-free listening any time, any place. Its sound quality rivals that of systems many times its size. 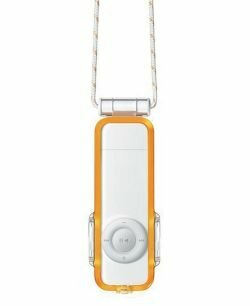 Sleek in design like the iPod itself, the inMotion system matches the iPod color scheme and features a built-in docking bay located between its speakers. 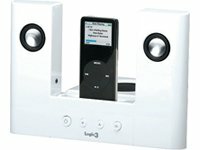 When docked inMotion's iPod bay, your music player can perform all the same data transfer and synchronization functions possible via Apple's standard, free-standing iPod dock. inMotion even takes advantage of iPod's alarm feature to create a fully-functioning alarm clock that plays wake-up music of your choice--perfect for travel or dormitory use. Other convenient features include a minijack .125-inch headphone jack for private listening; an auxiliary stereo minijack input for hookup with other audio devices such as portable CD players, laptops, older iPods, and other MP3 players (an interconnect for this purpose is included), and built-in, flush-mounted power and volume controls. The secret to inMotion's strikingly deep bass is a combination of specially designed neodymium micro drivers and MaxxBass technology. Founded on the principle of the "missing fundamental," MaxxBass generates a specific set of harmonics in response to bass input; the brain then interprets these harmonics as the intended bass sound. The technique is used in commercial audio systems for restaurants, high-end retail environments, clubs, and other venues where exceptional fidelity is essential, but where large speakers or subwoofers are impractical. inMotion's Class D amplification provides maximum sound with minimum power consumption. Smaller, cooler, and more efficient than other amplifiers, inMotion's onboard amp can support up to 24 hours of continuous playback on just four AA batteries (not included). 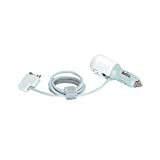 For desktop or other indoor use, inMotion also includes an AC power supply that recharges the iPod anytime it sits in the inMotion docking bay. The balance of size, weight, and sound quality makes these speakers a traveler's dream, whether or not you own an iPod. But do not expect the sound quality to compare to that produced by large floor or bookshelf speakers. My side-by-side comparisons indicated that the sound quality of these speakers was also inferior to similarly priced "2.1" satellite speakers with powered subwoofer that are designed for computers. However, given the size of these inMotion speakers, the sound quality is very impressive (as long as the volume of the sound output to the speakers is set correctly: see below). I recently used the speakers every day during a three-week business trip to the Balkans. I like to travel light and prefer not to check luggage. These speakers are extremely small and light weight and fit into my carry-on bag without any problem. The speakers come with a universal power adapter (110V to 220V) that is usable in Europe. But I left the adapter at home, brought a small battery charger, and ran the speakers on rechargeable NiMH batteries. The speakers ran about 8 hours on one set of these batteries (4 X AA 1.2V 2300mAh NiMH). The volume of the speakers was more than enough to fill my hotel room. In fact, I never felt like playing the speakers at full volume. The speakers do not seem to distort at the highest volumes. The speakers faithfully reproduced a wide range of music including hip hop, rock, folk, blues, funk, jazz, and classical. The bass response is impressive for such small speakers. I can clearly hear the bass tracks of blues CDs (Eric Clapton's latest) and Rap albums (Snoop Dogg). However, the speakers do not produce the heavy bass feel you get from a powered subwoofer. That means you do not feel the bass pounding in your chest. But this is actually a good thing in hotels. Powered low frequencies travel unimpeded throughout a building, whereas the frequencies produced by these speakers are quickly absorbed by walls. This means that I was able to play the speakers relatively loud late at night without disturbing the people in the next room. A second advantage is that it takes much less energy to drive these speakers than larger speakers or a subwoofer. This allowed me to play the speakers for 8 hours on four AA batteries. I do not own an iPod and always played the speakers directly from my computer. I connected the earphones-out plug from my computer to the auxiliary jack on the iPod speakers. An extended cord is needed for this connection; the cord that comes with the speakers is too short. This worked well and allowed me to play new CDs I bought while traveling. But through experimentation, I discovered that if the volume setting on my computer was too low or too high it severely affected the sound quality of the speakers. Since the speakers have their own volume control, I can set the sound volume however I want, regardless of the volume output of my computer. However, when the volume on my computer was set too low, the speakers produced an inferior muffled sound. And when the volume on my computer was set too high, the speakers occasionally produced distorted sound. I eventually learned to adjust my computer volume to a medium level before connecting the speakers. Unfortunately, different CDs and MP3s are set with different default volume levels, so I had to reset my computer volume every time I switched albums. Sure, we love to listen to our iPods on the plane, especially with noise cancelling headphones, but do you really want to be that isolated in your hotel room? These speakers have great sound considering their size and portability, run on 4 AA batteries, and look great with the iPod attached. If you travel with a laptop with decent speakers, this wouldn't be an item you need (you could just us iTunes to play your iPod), but you still may want these speakers to take the the beach, etc. Only complaints: why is the supplied power cord so ugly? The bundled power cord is the standard black cord with a AC converter attached to the plug. You can use your iPod Firewire cord and AC adapter with these speakers, but oddly enough, this will only charge the iPod and not provide power to the speakers. So far, I've gotten about the 24 hours on the AA batteries as claimed. I also have to take off my iSkin to use this, but I guess that's my problem! Portability makes these a "must-have"
After weighing all the options for small speaker options for the iPod, I decided on this system. Why? 1) SIZE: Yes, other systems that are slightly bigger probably have better sound, but with the folding feature and carry bag that comes with this system, it's unbeatable. 2) PORTABILITY: Closely linked with size, but with other key factors: Battery use and lack of parts. It uses 4 AA batteries and if you don't take along the power cord, it's one small piece when folded. That's it. You're gone. 3) EASE OF USE: With the built in iPod dock that lets you charge while listening, it is just too easy. But that's not all! You can connect to your PC via the system's base and do all the normal functions. But wait, there's more! Since the iPod is docked it leaves the headphone jack open. 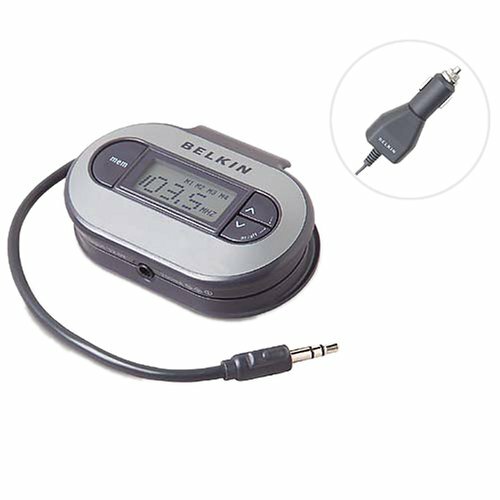 If you happen to have the iTrip (or other FM transmitter), you can use this jack and transmit to other speaker options using FM. This is useful in situations where others might want to share your collection (e.g. the beach). Then you and others can listen. 4) THE COOL FACTOR: I'm not sure how to put a price on this one, but I paid $109 and the cool factor is probably worth $75 of that. It just looks cool, and since it is clearly made for the iPod, gawkers know it's probably the latest thing. Since it's so easy and sounds so good, I've taken to moving the speakers to wherever I am in the house instead of having the home PC play through the home speakers throughout the whole house. We're not talking earth shattering sound here, but for one/two room or office use - these are excellent. i am replacing my cambridge speakers with this little compact unit. the inmotion sounds adequate for its size but if you're a bass junkie like me you have to have more bass. just to experiment i plugged the jack from the (cambridge) sub into the headphone jack of the ipod and voila, nice tight bass, controlled by the ipod volume, and speaker volume controlled by the inmotion panel. if you have a small sub already,you're set, otherwise add the price of a computer size sub to use with this set. i set the ipod to "treble boost" since i have the sub hooked up. the sound is wonderfully rich and you won't complain because you have highs and lows, perfect for the office! just remember when travelling around with it, you're back to so so sound, but for something this size, it's great. here is the downside i've found so far. plugging into the back dock, the ipod says "do not disconnect" and the ipod never mounts. Before I got this adapter, I was just using a cassette adapter and an FM transmitter in the car. In both cases the iPod was struggling to provide enough power output to provide clean undistorted sound, and still having to crank the volume control up all the way on both the car stereo and the iPod. This product solves that problem, and charges your iPod to boot. It uses the new line out capabilities through the docking connector. You then plug your adapter into a mini-plug jack located on the power adapter. Adjust the aplifier volume on the adapter as well. The built in amplifier provides enough power now so I don't have to crank the volume on the car stereo, making the sound to be fuller, richer, more accurate and eliminating all the hiss & noise caused by having to turn up the car stereo all the way. The only things that might need to consider is the mini-plug output for the amplifier and volume controls are on the side of the cigarette plug. While this wasn't a problem for me, people with resessed power plugs in their cars might have difficulty with it if your cassette adapter/fm transmitter doesn't have a angled plug (I have a MB that has a power adapter in a recessed ashtray and it's challenging to use that plug because of space requirements, but does work after some adjustment). Belkin should have put these on opposite sides of the device, but should only be a minor inconvience. I don't envision anyone having to adjust the output volume very often, after you set it for the first time. I highly reccomend this product to anyone wanting to listen to their iPod in the car. I think that the folks that gave this product low ratings have electrical systems in their vehicles that are not compatible or are hooking it up wrong (somehow?). This charger should not have any effect on the hissing sound through a cassette adapter. There are many ways to use the line output with this product: If you have an aftermarket cd player that has a line input on the front of the head unit, you can use a 3$ mini stero jack cable and hook it up that way (from the ipod headphones or the Charger). Better yet, in my case my cd player has RCA line inputs on the back, so I just bought a Mini Stero Jack that splits to two RCA's and plugged them in...AWESOME SOUND!! I recommend the charger, and for me it works great!! From my Car Stereo Head Unit, I bought a 15 dollar rca adapter to convert the CD changer port to a standard RCA Input. Go out and buy a 5 dollar RCA to Mini cable and connect that from the RCA adapter to the Auto Kit. Connect your IPOD to the Auto Kit, and away you go. The best sound you can get from your IPOD. No static Cassette, no low sound FM transmitter. Just straight RCA input into your Car Stereo.<br />Total cost approx. 55 dollars to get the best out of your ipod while charging. After buying two cables and the Auto Kit. 1.5 years and still going...<br />Worth the buy. This device is not worth the $30+ since the amplifier function is so hit and miss. With my car stereo & iPod mini the signal produced from the "amped" line-out on the charger is about 1/50th of the volume produced just by hooking the tape adapter into the normal audio-out on the iPod. I didn't even think the charger's line out was working at first until I cranked the stereo all the way up with the "amped" line out volume on max. Basically, I paid an extra $10 for a non-feature. In hindsight I should have ordered the DLO charger only for $20 from somewhere else because all I have is a charger. Does everything I want and looks coooool . . . . I love running with my shuffle in this case, and can't imagine that anything else could get the job done so elegantly and so well. One of the bad things about the Shuffle is that you really have to spend the extra money for some kind of case to protect the fragile instrument.However, this sport case is NOT the answer!The price is so high compared to other similar products that do the job just as well.I ended up getting a really nice red silicone case from a store in CA, and at under half the cost of one of these sport cases.Apple tends to make their money on the accessories that go with the products, not the products themselves.Before you spend your hard earned money on this, you should look around in stores and on the Net for other deals on better products. I have been using the case for 2 weeks now, it took a long time to get it from Amazon but it was definitely worth the wait.This case is truly a thing of beauty, I can't imagine anyone putting so much thought into the design of a case for an MP3 player.I would imagine this is somthing that Gucci would have designed and sold for $300 and everyone who has seen my shuffle case has fallen in love with it. It is a tad heavy but otherwise, it is perfection. I LOVE my shuffle for running, because unlike any other device I have run with, it doesn't skip and it's small and lightweight.However, I HATE earbuds.Every time I try to run with the earbuds that Apple provides they fall out and I don't really like the feeling of having something in my ear.So I prefer to use my own headphones when using the shuffle.When I bought this case, I was looking for something to protect my shuffle.It does seem to be heavier than the shuffle itself, but it is essentially water-tight and makes me feel more comfortable running with my shuffle, especially in the rain.The added weight in my mind is even a plus, because it helps to anchor the shuffle when you are running.If you choose to use your own headphones with the shuffle, the case comes with an extender cable to allow you to plug in your own headphones.When I was running last week, the extender cable shorted and I was only able to hear music out of my left ear.Thinking it may be the headphones, I plugged in a separate set of headphones with the same results.Then I plugged the headphones into my shuffle and could hear out of both ears.Deciding it was the extender cable, I took the case to the Apple Store and they gave me a new one even though I didn't have a receipt (Apple's customer service is the reason for my giving this product four stars instead of three), but the extender cable is still flimsy and I can't help but feel that it will only be a short time until this shorts out as well.Considering Apple doesn't sell these cables separately, I would recommend that you either use the earbuds that come with the shuffle to use this product (or find a set of headphones that will fit in the small hole designed for the headset) or take VERY good care of your extender cable.I only had my case for a few weeks before it broke. I bought an iPod Shuffle specifically for jogging and cycling and was a little disappointed to discover it wasn't moisture resistant. The Sports Case is a perfect, though slightly-expensive, solution. I got caught in a heavy downpourduring the last half hour of a run and continued using my iPod without a problem. Unlike other reviewers I didn't find the added weight to be a significant issue. As for the lanyard: I cut it off and tossed it the first day - no loss.The controls are easy to use and the whole thing fits neatly into a pocket or the palm of your hand. If you're going to use your Shuffle outside frequently, the money for the Sports Case is well spent.